Rare North End Anna Maria Location: Close to the Gulf Beach with Deep Water Boating access! Upon stepping into this impeccably remodeled 3 bedroom, 2 bath waterfront home, you will fall in love with the airy, open floor plan and fresh coastal feel. This comfortable, convenient ground floor home is characterized by contemporary fluidity, the configuration of main living spaces, and privately located bedrooms which allows for easy entertaining and comfortable everyday living. Recently remodeled with new kitchen and bath cabinets, marble tile, hard wood flooring, stainless steel appliances, LED Lighting, metal roof, hurricane windows, new amazing pool, travertine pavers, new hardy siding, new landscaping, and circular drive. The large Florida/Great Room overlooks a large tropical oasis of a backyard, with your brand new private pool as its centerpiece. The pool has many features including spa, sun shelf, sitting areas, in water dining table, etc. The yard is professionally landscaped with tropical foliage including numerous coconut palms. The master suite is spacious and elegant, with marble tile, walk in closet and also has direct slider access to the pool area. Turnkey Furnished, with the exception of Original Art. 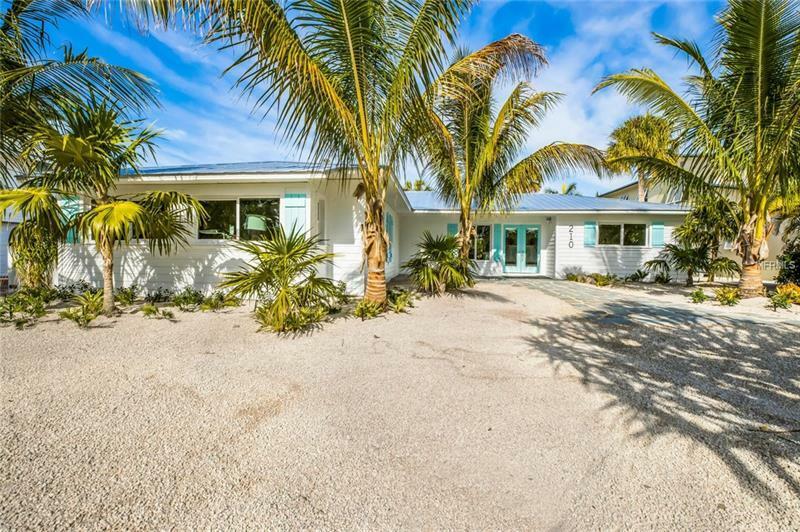 Located at the desirable North End of Anna Maria Island, with close proximity to Gulf Beaches and deep water canal access directly to the bay (no bridges), this home wonât last long!